Both large and small-scale producers continue to operate in aquaculture, even if frequently the economic pressures on small fish farmers are immense and some branches of aquaculture (such as salmon rearing) have tended to organise on an ever-larger scale. How small producers have survived in Irish rope mussel aquaculture is the question posed in this paper. Based on 18 months of ethnographic study in the West of Ireland’s Killary Harbour, the contribution that formal and informal cooperation has made to the persistence of small-scale mussel production is assessed. Although formal and informal forms of cooperation are by no means the only conditions of the persistence of small-scale production in the Killary site, they are shown to have critically improved the survival chances of individual producers and of groups of producers. What is also shown is that informal cooperation has significantly eclipsed formal cooperation since 2000. Aquaculture production has grown significantly in the last decade and now comprises approximately 50% of the world’s supply of consumable fish (FAO 2012). Currently aquaculture is estimated to employ 23.4 million persons worldwide and is seen as an increasingly valuable food source for a dramatically enlarged global population (Valderrama et al. 2010). The expansionist tendency of capitalism might suggest a continual concentration of capital in aquaculture, and such a tendency is evident in salmon farming in Ireland and elsewhere. Within the sector, however, both large and small producers continue to exist and by no means does small-scale production look like disappearing in the near future. In addition to the element of local control, what distinguishes small-scale aquaculture is the use of relatively small in-shore boats, low-cost farming technologies, limited amounts of capital investment and a heavy dependence on the producer’s own labour and that of family members (FAO Food and Agriculture Organization of the United Nations 2012). Irish aquaculture can be viewed as having developed along two diverging paths. The first path, in keeping with capitalism’s expansionist tendency, has seen aquaculture develop along large-scale lines. Salmon farming, where a relatively small number of highly capitalised producers have historically dominated the industry (Phyne 2010; Ruddy and Varley 1991), exemplifies the large-scale path. A contrasting path, very evident in rope mussel farming of the sort found in Killary Harbour (PricewaterhouseCoopers 2006), is distinctive for being small in scale. This paper will explore the micro politics of survival among the small-scale fish farmers of Killary Harbour, one of Ireland’s largest mussel-farming sites, by considering in particular the respective contributions of formal and informal cooperation to the ability of small producers to survive. Four sets of conditions can be seen as important to the survival chances of small-scale natural resource enterprises. In the first of these, the focus falls squarely on economic considerations. The contention of Mann and Dickinson (1979) is that the reluctance of capitalists to invest in production agriculture reflects the length of the production cycle, the high production risks and difficulties relating to labour supervision. While intensive salmon farming can and has overcome these limitations in Ireland (Ruddy and Varley 1991: 78), the same is much less true of that branch of aquaculture that uses a rope technology to farm phytoplankton-feeding mussels. An early study suggested that the lower profit margins in mussel farming had helped restrict external capital investment penetrating the industry in north Connemara’s Killary site (Ruddy and Varley 1991: 78), thus allowing local people with access to but small amounts of capital to become fish farmers. The seasonal nature of much farming activity and the heavy reliance on temporary as against permanent labour have been taken as other important reasons why rationally organised and capital-intensive farming departs from 'the norms of industrial capitalism’ (Worsley 1984: 160). It is on the household that the second set of conditions focuses its attention. Especially under the influence of the Russian agronomist, A. V. Chayanov, much importance has been accorded to the deployment of household labour, and to the willingness of household members to endure high levels of self-exploitation, in order to secure household survival. By now an immense literature, much of it informed by Chayanov’s ideas about peasant rationality, has accumulated around the topic of the production practices small-scale natural resource producers have devised to improve their survival chances (Van der Ploeg 2013). Household-based production practices may also count for much when economic diversification occurs. Thus Menzies’ (2003) study of small and medium-scale commercial fishing in the Bigouden region of France shows that many families in diversifying from agriculture into fishing relied on the self-same household arrangements of deploying family labour that sustained peasant farming (2003: 75–76). Critically, reliance upon a supply of unpaid family labour removed paid labour costs from the production process at a time when the diversifying farmer-fishers faced testing economic challenges. A third set of conditions points to the importance of the state in regulating the economic environment in which production occurs and in stimulating small-scale enterprise. Thus Phyne (2010: 1), in accounting for how small-scale aquaculture continues to persist internationally and in spite of a strong underlying trend for food production to increase progressively in scale, points to the significance of strong national state policies that help buffer local regions from the advance of neo-liberal economic forces and the concentration of capital at the expense of small-scale producers (see also Curtin and Varley 1991). From being a fledgling industry in the 1970s, fish farming in Ireland has, under state stimulation, steadily developed to make an important economic impact to coastal rural areas. Furthermore, many of the accruing economic benefits have spread themselves across Ireland’s remote and economically disadvantaged western seaboard (MERC 2008: 5). The total value of Irish aquaculture was estimated at €124.6 million in 2007 when 2,058 persons found employment in the industry (MERC Consultants 2008: 2). The fourth set of conditions, the one we wish to explore here, stresses the importance of 'cooperation’ to the survival chances of small-scale producers. Our discussion will distinguish between formal cooperation, found within formally organised cooperatives, and the informal cooperation to be found outside them. The most general process that underlies formal cooperative activity is the pooling of resources by a membership (Esman and Uphoff 1984: 62). Thus, members of a fish-farming cooperative pool their savings and labour power or capacity to work. Less obviously, normative expectations relating to trust and reciprocity between friends and neighbours may be pooled in both the formal and informal forms of cooperation. Typically individuals carry such normative expectations with them into formally or informally organised instances of cooperation from the wider society in which they live. Besides the phenomenon of pooling in all its dimensions, formal cooperatives have been seen as normatively structured around three basic principles. These stipulate that it is 'the users of a co-operative who are supposed to own, control and enjoy the benefits of the business’ (Ward 2000: 26). To the extent that these principles operate in practice, ownership and control of a cooperative become vested in user-members rather than anonymous or known investors. And, where benefits are concerned, servicing the needs of a membership takes precedence over profit maximization. The ability of formal cooperation to boost the survival chances of small-scale enterprise has long been recognised. Max Weber (1991  : 367–8) observed how cooperative credit provision and marketing among small farmers, by allowing them benefit from economies of scale, could do much to offset the market disadvantages that came from being small. For over a century Denmark has provided an exemplary case of cooperative organization becoming an important means of securing the survival of commercial smallholders (Manniche 1952; Chloupkova et al. 2003). In more recent times, Menzies’ (1993) study of British Columbia also highlights the crucial role of local cooperatives in facilitating family fishers to share capital, knowledge and labour with others in the fishing community. Why might individuals choose to cooperate? Some have emphasised the importance of relationships involving trust, and expectations pertaining to reciprocal exchange, as the normative foundations of cooperation (see Wolf 1966). Thus Ostrom (2010) suggests that cooperation will not succeed without the ability of the relevant parties to trust each other. The importance of instrumental reasons has also been highlighted. Here the suggestion is that producers see cooperation, and the reciprocal sharing of resources, as the most rational option available to them in the context of their own specific circumstances (Popkin 1979; Stone and Potsdam 1996; Wolf 1966). While the four sets of survival conditions outlined above are all relevant to varying degrees, this paper will explore the possibility that both formal and informal cooperation has been especially significant in small-scale aquaculture’s struggle to survive in Killary Harbour. Cooperation has been a central element of the two phases of development into which the history of small-scale Killary mussel production can be divided. The first of these phases saw the prospective fish farmers set up their own cooperative with a view to sharing costs, physical resources, labour and knowledge. The decision of a number of the mussel producers to break away from the cooperative marked the beginning of a second developmental phase in the Killary. These breakaway producers expanded the physical size of their sea farms, thus acquiring a greater segment of the area available for mussel farming than that controlled by the cooperative. They also began to employ local youths as hired labour. Leaving the cooperative, however, did not mark the end of cooperation among the breakaway mussel producers. Very soon, in response to the difficulties encountered outside the cooperative, new informal forms of cooperation began to appear among pairs of the breakaway mussel farmers. 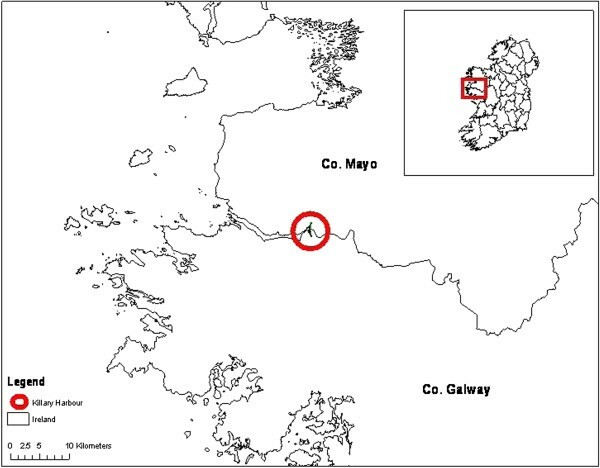 Currently the Killary mussel-farming site (Figure 1) supports the part-time employment of 23 persons, thirteen owner-operators and ten hired workers temporarily employed at key points in the production cycle. The mussel owner-farmers may rely on aquaculture as the primary strand of their household incomes, but they also supplement their sea-farming earnings with employment in small-scale agriculture, in construction, small-scale inshore fishing, in tourism and in factories. Sea farming in Killary Harbour succeeded in harvesting mussels valued at €1.29 million in 2007. To proceed, we will begin by outlining the methodology used in the study. Then we will examine the place of formal cooperation in the early days of establishing mussel farming in the Killary, how mussel aquaculture developed over time and why a number of producers decided to break away from the cooperative. The effects on the cooperative of the loss of members will be assessed, as will be the importance of informal cooperation to the survival of the breakaway producers. Our data are chiefly derived from eighteen months of ethnographic fieldwork among the mussel farmers of Killary Harbour. Relying on the techniques of participant observation, the senior author repeatedly observed the mussel farmers at work; and conversed with all thirteen of the current owner-operators (see Cush 2012). He further became acquainted with the ten temporary wage-labourers employed by some of the producers. So as to cover the full range of work practices, these observations and conversations took place at different points across the 18-month mussel production cycle. Observations and conversations were supplemented with more formal semi-structured interviews with the producers (all given pseudonyms here); and these permitted the verification or discounting of some initial observations. Seven former producers, who have since moved away from the industry, were also interviewed. All these interviews yielded valuable insights into the contribution of formal and informal cooperation to small-scale aquaculture’s survival during the industry’s development over a 30-year period. Secondary sources were also consulted. Among these were state reports, the cooperative’s files, and press accounts of Killary mussel farming. Besides the data’s own inherent value, it was also of use in helping to jog the mussel farmers’ memories of important events in the development of the industry. As it was clear from an earlier 'baseline’ study that a number of state agencies and agents had played a decisive role in initiating and stimulating formal cooperation in the Killary site (Ruddy and Varley 1991), a number of state personnel were either communicated with or interviewed. These individuals worked for such bodies as Bord Iascaigh Mhara (BIM, Ireland’s Sea Fisheries Board), the Department of Agriculture, Fisheries and Food (Aquaculture Licensing Division), The Combat Poverty Agency of Ireland (CPA), The National Board of Science and Technology (NBST) and the local development company in northwest Connemara, FORUM. In the process of collecting and analysing the data, it became clear that Killary mussel farming could be divided into two distinct developmental phases. The first phase, in which the cooperative was the central player, lasted from 1980–2000. The second phase, which still continues, commenced in 2000 when five cooperative members broke away to function independently. Two of the breakaway farmers teamed up with other local individuals in 2000 to set up joint enterprises, thus increasing the number of independent owner-operators in Killary to seven. What follows then is an in-depth account of these two developmental phases with a view to assessing the contribution of formal and informal cooperation to the persistence of small-scale mussel production in the Killary site. Mussel farming in the Killary began in the early 1970s after a young marine biologist discovered that the bay was rich in the phytoplankton that mussels feed on. The bay was additionally favoured by having good shelter from storms developing in the northeastern Atlantic, and the water temperature was ideal for growing mussels efficiently. Subsequently Beirtreach Teoranta (BT), a subsidiary of the commercial state-sponsored company Gaeltarra Éireann, commenced experiments with suspended mussel culture in the Killary. The results were sufficiently encouraging to prompt BT to embark on limited commercial production in the bay. Prior to the shellfish cooperative’s appearance in 1980, local north Connemara community councils had commenced negotiations with a number of statutory and voluntary agencies with a view to achieving local participation in aquaculture. Such talks proved to be protracted (over 100 meetings were held between 1975 and 1980), frustrating and ultimately inconclusive (O’Donohue 1982). Eventually BT agreed to supply mussel culture information to local persons interested in starting their own mussel farms. At this point, however, BT was itself moving toward commercial production and therefore tended to view other would-be mussel farmers as competitors. Although developments in the 1970s convinced local interests that aquaculture had great promise, the young marine biologist, now employed by the NBST and living locally, would have a major input into the form local shellfish aquaculture would assume in the Killary site. His belief was that both the Killary and its surrounding communities would benefit most by adopting a small-scale and low-cost approach. Maximising local participation and ensuring local control of the resource were central elements of the developmental model he advocated. With no significant barriers to entry, he believed that local people could relatively easily set up in the industry, and that the income earned would make an appreciable difference in what was a remote and economically and socially declining district of the far west of Ireland (Interview: NBST biologist, 16/3/10). The biologist then began to approach a number of state and local development agencies with a view to getting them to promote the small-scale model of mussel farming. Eventually, these agencies accepted that mussel farming as conceived by the NBST biologist did indeed promise to be a significant source of local employment (Interview: NBST biologist, 16/3/10). A training programme, run by the NBST in conjunction with BIM, the Department of Fisheries, the CPA, and a number of local development agencies, was launched in 1979 and local people were encouraged to take part. The trainees learned about the biology of the mussel, the mussel growing cycle, the construction of rafts and long-lines, the available grants, licensing requirements and the principles of business organisation. In the course of the training programme it was suggested by BIM, NBST and CPA personnel that those interested in mussel farming should consider setting up a cooperative, as this would permit them to significantly reduce their costs and facilitate their individual and collective survival in the industry (Herriot 1980). Out of the 1979 training programme emerged a group of 15 men from the communities surrounding the Killary who, for reasons relating to costs and benefits, could see much merit in the idea of forming a cooperative. Even with the set-up costs being relatively low, they still represented a significant obstacle for the individuals involved. Acquiring a proper boat would be particularly costly. A cooperative would allow them to share costs and as a result significantly reduce them (Interview: Joe, former cooperative member, 25/5/10). Something else in the cooperative’s favour, as proposed by the marine biologist and other state functionaries, was that it would take full responsibility for marketing the mussels, thus allowing the producers to concentrate on the production side of sea farming (Interview: Ollie, cooperative member, 12/9/09). On the strength of such considerations, the 15 individuals decided to form the Killary Fish Farming Cooperative. In the initial stages BIM, NBST and the CPA assisted the producers in purchasing farming gear and developing their farms, and in imparting knowledge about mussel biology and growth cycles (Interview: NBST biologist, 16/3/10). The advice state personnel provided on financing and marketing, areas where the local men lacked the necessary experience, was also crucial in getting the cooperative off to a good start (Interview: CPA officer, 15/10/09). The NBST biologist worked out that initial investments per head would amount to Irl£750 on rafts and Irl£1,000 over the full 18 months it takes to grow mussels to a commercial size. His advice was that the cooperative should avoid investing in a customised mussel boat at first; instead, the producers could use their own half-deckers and currachs (west of Ireland rowing boats that nowadays are typically fitted with outboard engines). The biologist’s estimation was that over the first 18-month growing cycle each farmer would produce approximately three to four tonnes of mussels, with sales amounting to Irl£1,500 per head. If these targets were reached, producers would be able to pay off the capital costs of their rafts, and even break even after the first growing cycle. The anticipated profits to be made in the second growing cycle could then be re-invested in purchasing more rafts and long-lines, thus allowing each mussel farmer to develop and grow his output. So as to ensure that the cooperative would cover its running costs, it was agreed that each member would contribute ten percent of their annual sales to the common pool (Herriot 1980). The advice of the NBST biologist was that decision-making in the cooperative should be consensual. And even though a secretary would have to be employed to look after bookkeeping and marketing, he stressed the importance of membership control with everyone being actively engaged and having a real say in the cooperative’s affairs. Apart from the valued democratic aspect, active engagement would encourage individuals to see the system as fair and as worth committing themselves to. Another of the biologist’s recommendations was that the cooperative should concentrate on producing high quality shellfish and selling to the French fresh market where prices are higher than those commanded by canned or processed mussels (Interview NBST biologist: 12/2/10). Although the NBST biologist was personally respected and his suggestions and those of other state functionaries regarding the cooperative taken very seriously, the endorsement of his suggestions by two especially influential cooperative members proved decisive (Interviews: NBST biologist 16/3/10 and CPA officer 15/10/09). Their fellow cooperative members regarded these two individuals as natural or 'born’ leaders who commanded great respect in the wider community. Comments such as “them lads are smart men, so we always listened to them” (Interview, Liam, cooperative member 19/9/09), and “they were always good organisers and had a good head for numbers” (Interview Jack, cooperative member: 12/2/10), testify to the sort of influence these two men could wield. At the beginning such influence was quite crucial given the unprecedented character of the enterprise being embarked on (Interview: Ollie, cooperative member 15/4/10). And subsequently while decision-making within the cooperative remained consensual, the presence of the two influential men meant that the cooperative was not lacking in strong leadership. A substantial grant of Irl£35,000 from the Youth Employment Agency (YEA) permitted the cooperative to purchase its first customised mussel boat in 1984. The mussel farmers used this acquisition to expand output and free themselves from total reliance on the half-deckers and currachs they had been using up to then. So as to cover future running costs, the cooperative purchased a number of rafts in its own name at this point. These rafts were also used to train two young local men keen to become mussel farmers. These two men would in time replace three of the original producers prevented by other employment from committing themselves more fully to sea farming. In 1985, BT’s assets were sold off after it had gone into liquidation, and cooperative members further added to their capital assets by pooling their savings and borrowings to purchase some of BT’s Killary rafts. As the rafts were to be sold in large lots, the cooperative members could hope to purchase them only by joining together as buyers. Once purchased, the rafts were then divided up amongst the members in proportion to each individual’s investment (Interview: Tim, former cooperative member, 10/2/10). On the back of these developments, each member had a fully developed 4-hectare farm by 1990, and a potential annual harvest of 80 tonnes of mussels. As it happened, no one at first reached this potential, as all the producers had other work commitments that left mussel-farming as a subsidiary, albeit highly significant, income source. While seven of the mussel farmers were producing approximately 60 tonnes at this time, the other eight, with less time available to devote to their sea farms, were harvesting approximately 20 tonnes (Interviews, mussel farmers: 1/09/09 – 1/1/11). The overall production trend was nonetheless strongly upwards and, by 1990, approximately 600 tonnes of mussels were harvested, compared to the 60 tonnes produced in 1981. As output increased, the cooperative’s ten percent levy on each tonne of produce – subsequently changed to €100 a tonne - left it well positioned to cover its costs and modernise its equipment. A notable development occurred in 1990 when a cooperative member left the Killary area for personal reasons and sold his farm to an outsider who had recently settled in the area. This man (Manus), who made no secret of his intention to expand beyond the 4-hectare limit, had his application for membership of the cooperative turned down. He then applied and was granted permission by the state licensing authority to double the size of his mussel farm. Subsequently, he applied for and was given a further increase that brought the size of his mussel-farming operations to 18.55 hectares. The appearance of Manus in the Killary is significant for the reasons that, from the outset, he adopted an expansionist capitalist approach to mussel production and opted to rely heavily on hired labour. Manus’s expansionist approach contrasts strikingly with the cooperative’s equalitarian insistence on capping production at four hectares per mussel farm. This four hectare limit was again decided on NBST advice that such a practice would help conserve and divide evenly the Killary’s finite supply of phytoplankton (Joe, former cooperative member: 11/2/10). Another consideration in the size rule’s adoption was bound up with notions of adequacy, sufficiency and being content with achieving a 'modest livelihood’ (Liam, former cooperative member: 17/08/10). Here the reasoning was that a four-hectare farm, even allowing for the cooperative’s ten percent levy, would give each sea farmer access to a valuable strand of household income. Such a farm size was estimated as capable of yielding 70 tonnes of mussels per year and so achieving (at current prices) an annual profit of €43,000 (Interviews with mussel farmers, Joe (12/3/10), Billy (13/11/09), Liam (12/4/10), and Mark (19/10/10)). Besides significantly reducing the individual farmer’s capital costs, the cooperative also had the advantage of functioning in a way that reduced labour costs. This was so as long as the members were willing to pool their labour power. Typically individuals used their own labour in the day-to-day working of the sea farms, but especially at harvesting times relied heavily on the assistance of others. To sell in the premium fresh market the producers had to harvest and clean the mussels by hand as the French buyers were very strict on quality. If they were to fill big orders on time - up to seven tonnes a day - producers saw that they had no real option but to pool and share their labour power on a reciprocal basis. The widespread practice of the reciprocal exchange of labour within the cooperative meant that the hiring of wage labour (apart from one case where a mussel farmer regularly employed a helper) was almost entirely absent. Over the years much of this reciprocity has endured, and ethnographic observation testifies to its continuing strength today. Alongside the four-hectare size rule and the initially 10 per cent sales levy, there was also an informal acceptance within the cooperative that each member be given an equal share of the market. At times of peak demand, when orders of 20 tonnes per week had to be filled, the cooperative would strive therefore to ensure that each person had an equal chance to sell his harvestable stock. Typically, no one took unfair advantage of this arrangement, though normally some preference was given to those mussel farmers whose ropes were particularly heavily laden and therefore at risk of losing significant quantities of mussels to winter storms (Interview: cooperative members Ollie 16/3/10 and Mark 15/2/10). You will not find any formal conflict resolution systems in the coop. It never came down to it. Any rules we decided on were done out of a consensus. Often people would have come with their own individual demands and sometimes they may have been in conflict with each other. But we always sort them out amongst ourselves and the co-op would come to a collective agreement. We were all friends and we trusted each other so we never needed a formal system of rules (Interview, Ollie, 14/4/10; also Interviews Bobby 16/5/10, Joe 15/5/10 and Mark 19/9/10). The strength of trust and friendship between the cooperative’s members was evidenced during the working day in the amount of camaraderie, banter, joking and 'slaging’ (teasing) that permeated interaction among the sea farmers. As one mussel farmer remarked: “if you can’t slag a man, you don’t really know him”. These different expressions of light-heartedness, besides helping to structure working relationships, contributed to passing the time and to making the working day more enjoyable. From 1979 mussel farming in Killary was increasingly conceived locally as a community-based (even if heavily state-assisted at first) and small-scale form of economic activity. The idea of having an industry controlled by outside interests (such as BT up to 1986), and benefiting mainly outside interests to the exclusion of local people, became more objectionable (Interview, NBST biologist 16/3/10 and CPA officer 15/10/09). Only by throwing the industry open to local participation, it was contended, could local community interests hope to help address the root cause of the rural poverty and out-migration that North West Connemara had long suffered under (Forum 2008). Equality and reciprocity, as institutionalised in the four-hectare rule and in the practice of sharing knowledge, equipment and labour, were the critical organising principles upon which the cooperative chose to build its model of small-scale mussel farming. The practice of cooperation can be seen as a learning process that involved the deployment of these organisation principles, and that had the effect of crucially facilitating the survival of the individual mussel farms on the basis of a controlled and modest growth of output. In the second phase of development of small-scale mussel production in the Killary, now to be discussed, many of the core assumption that underpinned the cooperative’s approach came to be challenged. In 2000, five producers left the Killary Fish Farming Cooperative as they wished to expand their mussel farms beyond the cooperative’s four-hectare limit. Three of the breakaway sea farmers were young and newly married, with mortgages to service and young families to maintain, and it appears that their decision to break with the cooperative was motivated by their personal circumstances. In addition, the five breakaway producers were partly inspired by the example of Manus who had never recognised the four-hectare rule and who apparently was operating successfully as an independent producer. All five of the breakaway individuals would accept that the cooperative had served a vital purpose in the early years in getting locals mussel farming started and in putting it on a secure footing that allowed the individual producers to survive at a certain level. By 2000, however, they had come to believe that not only had a defining aspect of the cooperative’s approach outlived its usefulness for them personally, but also that they were being damagingly constrained in developing their farms further by abiding by the four-hectare size rule. The exit of these five members (and the presence of Manus) was not the only problem faced by the cooperative in 2000. On top of this, a number of the cooperative’s producers were growing too old to farm mussels and gradually began to disengage, thus eventually leaving but six current members in the cooperative, as compared to the starting fifteen. Three of these are veterans of the original group who formed the cooperative in 1980, and three others are young local newcomers who have joined the cooperative and been trained by it as mussel farmers. This six-member group is still committed to the original developmental approach revolving around the cooperative and area-restricted small-scale production. As of old, costs, equipment and labour are pooled and shared among the cooperative’s membership (Interviews with current cooperative members and ethnographic observations: 1/9/09 – 1/1/11). Each member continues to supplement part-time mussel farming earnings with other income sources. There are now a part-time electrician, two sheep farmers, two adventure centre employees and a social welfare recipient. One of the influential veteran leaders of the cooperative, the current secretary, continues to play a 'big brother’ role when important decisions come up. Among the reduced membership, the view that the cooperative still provides the best means of achieving individual and collective survival remains strong. The five breakaway producers who left to pursue a go-it-alone strategy in 2000 acquired, by virtue of expanding beyond the cooperative’s four-hectare size limit, a larger slice of Killary’s mussel-farming water. Compared to the 34.5 hectares (29%) currently in the hands of the cooperative and its members, the breakaway producers occupy 86 hectares (71%) of the mussel farming water. The average size of the breakaway farms is 17.2 hectares; and these farms range in size from 12.4 to 24.75 hectares. While the four-hectare model allowed each of the cooperative members to produce in the region of 60 to 80 tonnes of mussels yearly, the five breakaway producers are producing between 250 and 300 tonnes per year on their expanded farms (Interviews with breakaway producers: 1/9/09 – 1/1/11). To work their bigger farms, the breakaway producers have purchased their own private boats and hired in wage labour at harvesting times. Only one of the five breakaway producers chose to run his business solely on his own. Predictably, he could manage only by using local wage labour on a year round basis. In recent years this man has substantially disengaged from the industry. All of the others have formed partnerships of various kinds. One of the breakaway producers formed a business partnership with an old friend who wanted to involve himself in mussel farming. This newcomer, as well as contributing physical labour, attends to the marketing and bookkeeping sides of the business. Manus and another breakaway producer brought their wives into their expanded enterprises. Another teamed up with his brother as joint owners of the business. Interestingly, in spite of expanding their farms, all of the breakaway producers continue to retain secondary sources of paid work in construction, agriculture, sheep-farming and part-time fishing. Despite the rather substantial increase in farm size, the breakaway farmers still see mussel production in Killary as relatively small in scale by virtue of its relatively low levels of capital and technological investment. Furthermore, they point to how production has remained in the hands of local households (with the exception of Manus) rather than large companies from outside the district. Nor has cooperation disappeared outside the cooperative. While all the breakaway producers rely heavily on their own labour and on hired labour (at busy times), they have also come to depend heavily on cooperation with family members and other mussel producers in the bay. In the cases where wives have become involved in mussel farming (Manus has to be included here as well), we see new forms of cooperation within families emerging. The division of labour here sees the men looking after day-to-day maintenance at sea and the harvesting of the mussels, and the women concentrating on sales and marketing (Interview individual producers: 16/2/10 and 22/3/10). One of the other producers, as we have seen, shares the workload with his brother. Both of these men work side by side on shore and sea and also in sourcing markets. As one of the brothers is better at book keeping, he looks after that side of the enterprise. The brothers try to keep their partnership secure by achieving an even spread of work and benefits (Interviews: 10/5/10). Even though one of the other partnerships is not built upon kinship ties, the two individuals concerned have been close friends since childhood. The newcomer in this case drifted into mussel farming after having started a family and finding himself unable to provide for them through sheep farming alone. Again, the two men seek to share the production and harvesting workload evenly, although the one with the better “business head” looks after the bookkeeping and the sourcing of markets (Interview: Individual producers: 10/11/10). With no kin or friends involved in the business, the one breakaway farmer who runs a sole business is obliged to hire wage labour the year round. While still within the cooperative, the breakaway farmers could depend on reciprocated labour to fill orders at peak demand times. Once outside the cooperative, however, they faced new harvesting challenges. Typically orders from French buyers would come in on a Tuesday, and the producers would need to have twenty tonnes of cleaned fresh mussels ready for Friday. Outside the cooperative, due to the limited supply of labour, the breakaway producers struggled to get large orders ready on time. Wage labour did not offer a complete answer to their difficulty, as besides being expensive it has often proved hard to get good quality workers at short notice. The breakaway producers were also at a disadvantage with their available equipment (Interview individual producer: 7/7/10). In response to their predicament, three of the breakaway producers began to cooperate with each other so as to secure a better share of the fresh mussel market. These producers continue to harvest their own stock with their own equipment and their own labour forces. It is at this point that they pool their harvests so as to fill large orders. When mussels are sold in the fresh market they must first be removed from the sea and laid on the shore at the mid-tide mark. The experience of being submerged in the water and removed from it for a number of hours over a three-to-four day period, allows the mussels to learn to close when they are out of the water and so retain their freshness and prolong their shelf life. The producers must therefore harvest the mussels, bag them and then unload the mussel bags from the boat and lay them on the shore. Once the mussels learn to close, the mussel bags are then lifted on to pallets and loaded onto a waiting truck (Observations and interviews, individual producers: 10/10/10, 11/10/10 and 12/10/10). And, in due course, the proceeds of the sale are divided in proportion to the contribution each individual has made to the shellfish consignment (Interviews and observations, 11/10/09, 3/12/09, 2/2/10 12/10/10). Cooperation between the three men has been facilitated by the fact that they are all very close friends, having known each other for a long number of years. The young local men they hire from time to time also know the three producers well. The humour and banter, often observable during the working day within the cooperative, has been reproduced outside it to a considerable degree. By switching from the fresh to the processed mussel market, the other two breakaway producers did not face the same time pressures as those selling fresh mussels. The business plan the processed mussel farmers adopted was based on the assumptions that it was more feasible to mechanise their operations and to concentrate on quantity rather than quality (Interview individual producer: 8/8/10). In contrast, the three fresh mussel breakaway farmers, each one young and newly married with mortgages to pay and young families to support, did not find selling to the processed market attractive as the prices were too low. Manus and one of the breakaway producers who have opted to sell overwhelmingly into the processed market also make heavy use of cooperation and family labour. Their experience, no less than the others, has been that cooperation and the use of family labour are preferable to relying entirely on costly hired labour. We began with the suggestion that four sets of conditions have been seen in the literature as important to the survival chances of small-scale natural resource enterprises. While each set of conditions has relevance in attempting to explore the survival prospects of the Killary mussel farmers, we have paid particular attention in this paper to exploring the contribution of 'cooperation’. Before summing up what we have to say about cooperation, we must first briefly assess the contribution of the other three sets of conditions. The first set of survival conditions identifies economic considerations as central. Since north Connemara mussel farming did experience serious pressure to move towards greater capitalization and larger scale in its second phase of development, the question arises as to whether the pattern of small-scale aquaculture we have been describing is no more than a transitional stage. The critical issue here is whether the tendency towards larger scale, already in train, will usher in a third phase of development in which Manus or one or more of the breakaway producers (perhaps with a well-capitalised external partner) attempts to double or treble their current farming operations. Were this to happen the domestic commodity production currently in place would risk being overshadowed by a capitalist form of sea farming in which 'expanding cycles of accumulation (or expanded reproduction in Marxist terms)' operate (Sinclair 1985: 15–19). The possibility of Killary mussel farming assuming a fully capitalist form cannot be entirely discounted, although there is no real indication of it becoming a reality in the near term. The case of Manus comes closest even though his output appears to have levelled off and, interestingly, he has now discontinued his earlier practice of hiring in workers and become entirely reliant on supplementing his own labour with cooperative and family labour. Although the breakaway producers have larger farms, substantially greater output, make much more use of hired labour, and view themselves as farming on a larger scale than the cooperative’s membership, they still insist on seeing themselves as relatively 'small’ in size. Most critically, they do not see themselves as travelling along a progressively expansionist growth path. The most telling indication of this is the reluctance of any of the breakaway producers to commit themselves to full-time mussel farming. A related consideration is the view still taken locally of mussel farming as an enterprise and source of livelihood that can allow local people resist the economic pressure to leave north Connemara in search of paid work elsewhere. Both inside and outside of the cooperative, the principal expressed aim of mussel production is still to use it as a means of ensuring that the sea farmers and their families have a future in the area and will not be forced to migrate or emigrate. At the same time, it is very clear that members of the cooperative and the breakaway producers do not see eye-to-eye as to the level of mussel production required to secure an adequate livelihood from sea farming. The second set of survival conditions introduced at the outset revolves around the household, and more particularly the deployment of household labour and the willingness of household members to commit to do what is required of them to ensure household survival. The centrality of unpaid family labour to the survival struggles of the breakaway mussel farmers has been highlighted in this ethnographic account. Indeed, the significance of the labour family members - such as wives and brothers - have contributed is a very pronounced feature of the second developmental phase of Killary mussel farming. What this pattern further suggests is a major overlap between the set of conditions that highlights the contribution of the household and the one that places the emphasis on informal cooperation between friends, neighbours and relatives. Much of the observable informal cooperation in the breakaway farmer group can be linked to the household through marriage and kinship ties. A third set of survival conditions focuses on the state’s importance in regulating and stimulating small-scale enterprise. Over recent decades Irish state agencies have seen aquaculture as one of the few sources of sustainable long-term employment, outside of agriculture and tourism, for the spatially remote coastal communities of the west of Ireland (Phyne 1996). And in the case of Killary shellfish aquaculture there can be no doubt but that the state – in the guises of BIM, NBST and the CPA - was crucial to the cooperative’s formation and early development. The stimulus provided by the state mainly took the forms of grant assistance and the provision of expert advice relating to mussel biology, business and marketing principles, and cooperative structures and operating practices. Without such support it is highly unlikely that the cooperative would either have appeared or put itself on a stable footing over time. Inexperience and lack of capital assets made the prospective mussel farmers receptive to the early BIM, NBST and CPA message that organising as a cooperative would allow them to pool and share costs, and in consequence significantly reduce them (Interview: Joe, former cooperative member, 25/5/10). Our discussion of cooperation, the fourth set of survival conditions introduced at the outset, has focused both on the formally organised Killary Fish Farming Cooperative and the informal cooperative ties that have developed among the breakaway producers since 2000. Both the formal and informal forms of cooperation have involved the pooling of savings, labour power, and access to markets. Normative expectations, pertaining to trust and reciprocity between friends and neighbours in the wider society, have also been pooled both within and outside the cooperative. It has been shown that the cooperative was critical to the adoption of a distinctive model of small-scale mussel farming, and to the survival prospects of the individual sea farmers, during the Killary mussel farming industry’s first developmental phase. Cooperation, by facilitating the sharing of knowledge, equipment, labour power, and markets among the members, came to be viewed early on not only as critical to the survival chances of the individual mussel farmers but as synonymous with the small-scale model of mussel farming itself. Not alone did the actors themselves see the cooperative as central to their survival, but the practice of cooperation actually succeeded very substantially in delivering on survival. Very few producers fell by the wayside in the early years. Without the cooperative’s support and assistance, it is highly unlikely that individual producers would have either got going or survived in the industry. Trust and the willingness to reciprocate were important normative elements of the wider culture that influenced the individuals who formed the cooperative in the early 1980s. Within the cooperative, reciprocities based on trust were reproduced and became one of its fundamental organising principles, features described by Ostrom (2010) as essential for effective cooperation. Such a climate of trust was not universally found throughout north Connemara aquaculture. In other shellfish-farming cooperative ventures in the region, as Curtin (1993) shows, individuals, despite seeing clear economic benefits, failed to cooperate effectively due to poor social relationships and a consequent inability to draw upon and build feelings of trust. Of course, the prospective Killary mussel farmers were simultaneously rational actors who at first could see that they had little or no chance of getting going and surviving on their own in the industry. If they were to get a foothold in the emerging mussel industry, they needed to cooperate; and they were willing to cooperate because of the economic benefits that would likely accrue. Such rational cooperative behaviour resonates with Menzies’ (1993) study of small-scale fishing in British Columbia, where local fisher families were ready to share resources among themselves in order to sustain their livelihoods. Another of the cooperative’s normative foundations was the equalitarian desire, institutionalised in the four-hectare size rule, that all members should enjoy equal access to Killary’s mussel-farming water. That the four-hectare rule was and remains strong within the cooperative did not save it from being challenged by those members who by 2000 viewed it as inimical to their own individual interests. Loyalty to the cooperative, to its reciprocities and to the equalitarian impulse that contributed to its identity, proved therefore to be contingent rather than absolute among those producers who broke away to follow a go-it-alone pathway in 2000. Why this breach occurred was not simply a matter of rational man’s propensity for egoistic individualism trumping notions of social solidarity in the abstract. Instead, it can be related to social circumstances in the cases of three of the five breakaway producers, each one young and newly married, with mortgages to pay off and young families to support. The ethnographic account also makes clear that the breakaway producers have not turned their backs on cooperation in the informal sense. On the contrary, the five breakaway members still rely on informal forms of cooperation and it is difficult to see how they could survive without doing so. We have seen how three of them, each one producing mussels for the fresh market, have come to cooperate together in order to compensate for their individual inadequacies at times when large consignments of mussels have to be assembled at short notice for French buyers. The other two breakaway farmers, by opting to produce for the processed mussel market, find themselves relatively less pressured. They too, however, rely on the cooperation they receive from family members to run their businesses effectively. Despite the rise of forces that favour egoistic individualism in Celtic Tiger Ireland (Kirby 2005), we do not see the demise of cooperation in Killary Harbour as imminent, although informal cooperation has significantly eclipsed formal cooperation in the case study site. Both formal and informal forms of cooperation continue to endure and each has made a highly significant contribution to enabling small-scale mussel farming to survive. Such a conclusion is of more general significance given that small-scale production remains a prominent feature of Irish aquaculture, especially in the case of rope mussel cultivation. In recent years Bantry Bay Seafoods, which has operated grow-out sites in the southern county of Cork producing 4,500 tonnes of mussels, has been the major exception here (Phyne 2009: 186). Set against the sort of concentration represented by Bantry Bay Seafoods, figures provided by PricewaterhouseCoopers suggest that 59 mussel farmers were producing 8,755 tonnes of mussels (fresh and processed) in 2004; and that 55 of these harvested fewer than 500 tonnes per year (PricewaterhouseCoopers 2006). Such figures indicate that much Irish mussel production is spread out among a large number of relatively small sea farmers, even if significant concentration has become pronounced in Donegal (bottom mussels) and in Cork (rope mussels) (Phyne 2009). Yet, despite the pattern that these figures point to, little is known about the strategies that small-scale mussel farmers have devised in order to survive. This is where ethnographic accounts can be of use in allowing us to explore the range of relevant factors that sustain this branch of small-scale aquaculture. By no means is it being suggested here that both the formal and informal types of cooperation are the only factors at work in promoting small-scale aquaculture’s survival, but by using an ethnographic approach it is nonetheless possible to make a strong case for their critical importance in the Killary site. National Board of Science and Technology. This research was funded by the Irish Social Science platform (ISSP) under the Programme for Research in Third Level Institutions, administered by the Irish Higher Education Authority and co-funded under the European Regional Development Fund (ERDF). The authors wish to thank Prof. Chris Curtin of the School of Political Science and Sociology at National University of Ireland, Galway for his highly useful advice and assistance; and Prof. John Phyne of the Department of Sociology at St. Francis Xavier University, Nova Scotia, Canada for his comments and recommendations. Finally the assistance of the MAST editor is also greatly appreciated. The usual disclaimer applies. PC carried out the ethnographic fieldwork and co-drafted the manuscript. TV added to the theoretical discussion and co-drafted the manuscript. Both authors read and approved the final manuscript.